Republican presidential hopeful Mitt Romney has taken a bold stand on foreign policy, standing firmly atop the dead bodies of American diplomats in a sordid attempt to score political points. As is his habit, when it became clear that his charges were at variance with the facts, he repeated them. Perhaps that works in the murky world of private equity, but it’s less effective in international relations, where lives are at stake, not just other people’s money. So what’s Mitt Romney’s position on Libya? Take your pick; he’s had five of them. And that was just last year. 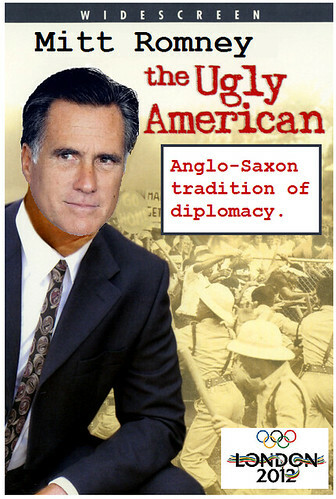 Apart from his accounts in offshore banks and his LDS missionary work in France, Mr. Romney has had little experience in foreign affairs. He’s certainly a quick study, though. First a world tour of gaffes, insults, and intelligence leaks; now this. This entry was posted on September 13, 2012 at 12:38 am and is filed under foreign policy, Mitt Romney, Republicans. You can follow any responses to this entry through the RSS 2.0 feed. You can leave a response, or trackback from your own site.